Happy Saint Patrick’s Day! 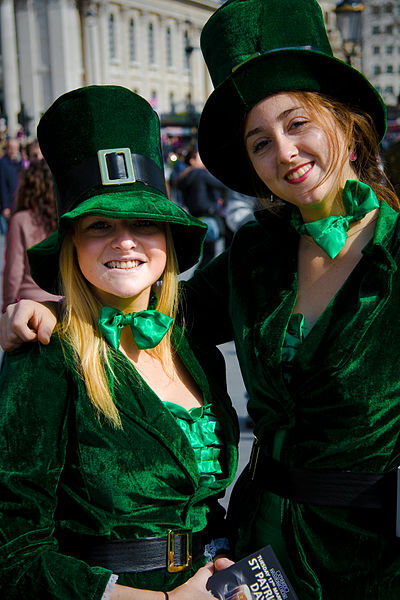 We have some Irish themed gaming ideas for you. There are two free pdf files to download. First some adventure ideas that can be used in the OTU. Irish themed pirates in the Neutral Zone between the (evil) Imperium and the Zhodani Consulate. 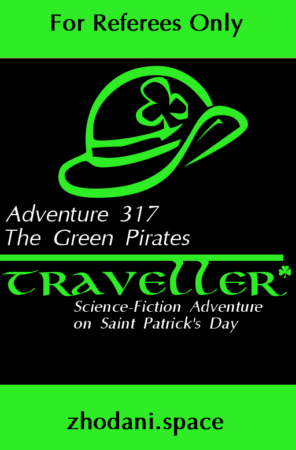 Then we want to remind you of the adventures in Eire Subsector that we have posted here before. 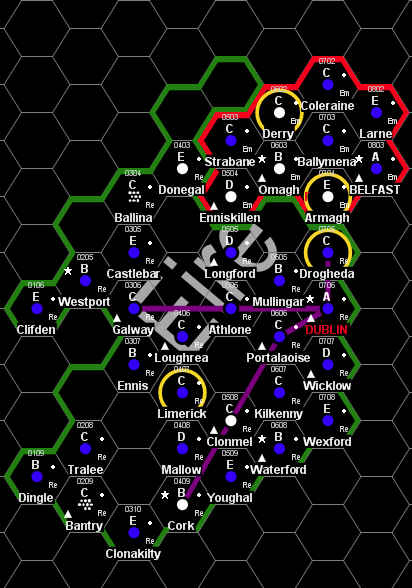 Eire subsector is set in an ATU. Both of these pdfs should be seen as a work in progress. If you have any ideas that you want me to add just contact me and we will add them in the version we present next Saint Patrick’s Day. While at a bar at the StarTown at Tremous Dex (SM-1311) and drinking a very black beer with a creamy head the PCs are approaches by a very small man in green clothes. I also wanted to remind you of Eire Subsector and the pdf with adventure ideas that you can download for free. 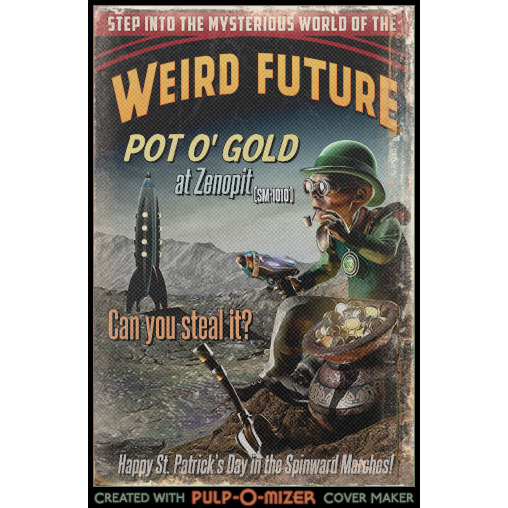 This year’s St. Patrick’s Day Contest was the last one. Now I have put all ideas (by BeRKA, Randy, Friz and Facebook fans) for this ATU into one free pdf-file. I hope you find it fun and useful. A quick competition. 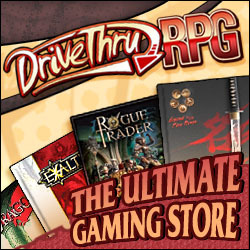 A $15 prize at DriveThruRPG for the winner. Design something (e.g. 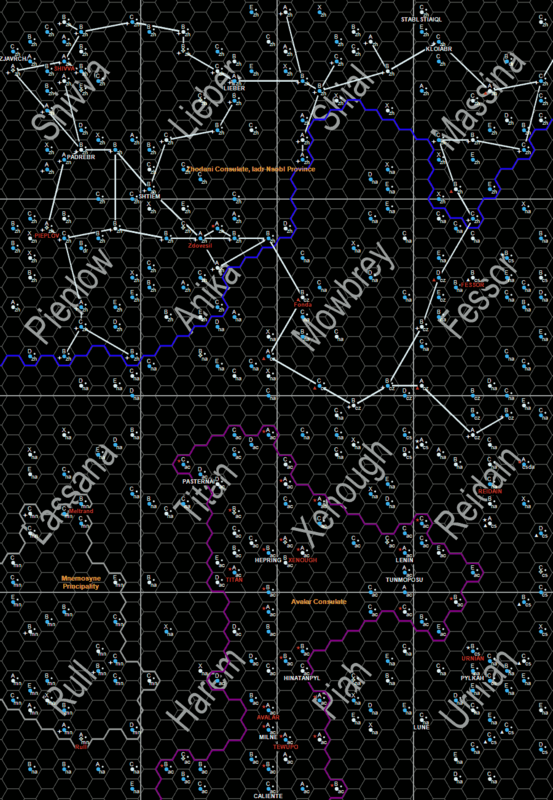 a character, a ship, a patron, a system) for the St. Patrick’s Map. The most interesting entry will win. Send Your entries by e-mail. Please use plain text format and attach any images. Word files will not be accepted! The competition starts now and ends 16 March 2014. Last years winner was Friz with the Patron, The Regretful Historian. The characters are between jobs on Mullingar when they are contacted by Professor Dugan O’Fallon of the Mullingar Institute of Historical Research (MIHR). MIHR is an academic organization that uses a substantial endowment from the local government and numerous corporate contributors to fund historical research and archaeological expeditions. Professor O’Fallon is a well-respected member of MIHR, having written many popular books on the early history of the Eire subsector. The meeting takes place in the Professor’s office at MIHR in the late evening hours. The professor has seen many a day under alien suns, as his cracked and leathery complexion attests. He is not well, occasionally getting short of breath as he speaks, and taking breaths of supplemental oxygen from a respirator mask. “Two months ago,” he says, “I hired an archaeological team for an expedition on Enniskillen. It wasn’t sanctioned by the Institute – I paid for this one out of my own deep pockets. You see, I have a personal passion for the history of this subsector, and the team I hired shared my particular passion for this subject, so they were all very eager to go. Unfortunately, the political situation on Enniskillen has deteriorated to the point where there are a number of armed resistance groups opposing the local government with acts of terrorism and violent confrontation. As the expedition is now two weeks overdue, they may either be victims or unable to leave the spaceport. “The mission is three-fold. First, I want you to travel to Enniskillen to determine what has happened to the expedition. The independent Far Trader Longshot will be lifting tomorrow morning and I have low berths reserved for each of you, along with two tons of cargo space for any possessions and an ATV, which you’ll need for the second part of the mission. “Second, I want you to rescue or recover the team and its equipment, including any and all data and artifacts it has collected. There is a packet aboard the ATV that will have the details you’ll need to determine approximately where the team was going and their most likely route. “Lastly, there is a Far Trader starship – Lady Starshine – that the team leased from an outfit here on Mullingar. The vessel needs to be returned here within the next month or the deposit will be forfeited and an additional financial penalty will be assessed against me as well. That last part is important because I used Institute funds to pay that deposit. If the deposit is forfeited, the scandal will end my tenure with the institute and my career as a historian. Enniskillen is currently experiencing a period of local unrest due to the actions of its government. Specifically, the government has engaged in a series of unpopular policies that have the appearance of benefitting members of the upper economic classes at the expense of the working classes. The government’s bureaucracy has become more insular of late and has been accused of using unfair and illegal practices to exclude all but the most favored members of the upper classes from being candidates for government employment and obtaining contracts from government agencies. This has spawned a series of popular protests as well as several extremist terrorist organizations which have made conditions in the main starport’s city, Dunbailey, somewhat precarious for travelers and business professionals. Enniskillen is a poor, desert world with much of its surface a trackless wasteland of sand and stone. Archeological evidence suggests that during a wetter time in the planet’s ancient past there may have been a sentient species. The current site drawing attention is a collection of what appear to be burial mounds discovered nearly five hundred kilometers southwest of Dunbailey. Due to the current political unrest, the government has prohibited all aerospace traffic (save spacecraft) from its skies until the current crisis has ended. 1. The team is stranded. Professor O’Fallon’s team is stranded near the archaeological site in the desert after a particularly vicious sandstorm has disabled their vehicles and communications equipment. The characters will have to venture overland to find them and return them to the starport, facing various terrain and animal hazards along the way there and back. 2. The team is being held hostage by terrorists. 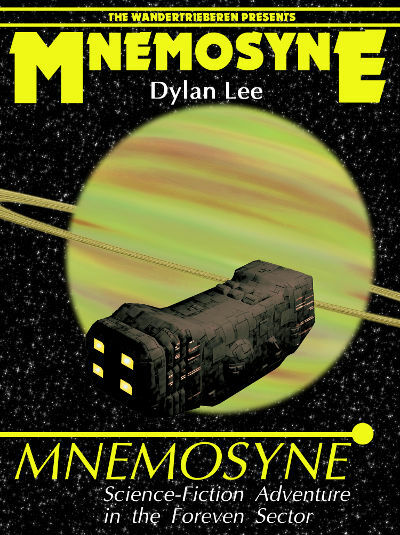 The Professor’s team has been mistaken for corporate prospectors by the locals, and a terrorist faction of the Liberation Coalition is holding the team hostage in exchange for the release of several prisoners held by the government. Luckily for the characters, the terrorists are a fledgling organization without much experience in these activities, giving the characters a shot at rescuing the team members. The referee will have to generate the terrorist faction members as well as map out the location where the team is being held. 3. The team is being held by the government. The Professor’s team has been swept up in the local movement and has been arrested by federal law enforcement for aiding terrorist acts. The characters will have to negotiate with the federal authorities to secure their release or mount a much more difficult rescue mission from a protected facility. The referee will have to generate the federal guards and officials, plus map out the facility where the team is being held. 4. The team is hospitalized. The Professor’s team got caught in the crossfire during a particularly violent confrontation between the Liberation Coalition and the government. In the chaos following the confrontation, the team was taken to separate hospitals with severe injuries and their records were lost in the haste to treat so many victims. The characters will have to investigate the situation in order to locate the team members and transport them back to Mullingar. 5. A rival has stepped in. One of the Professor’s longtime rivals got wind of the expedition and hired a mercenary team to kill the team members in the remote desert. The rival has also taken steps to disable the Lady Starwind so that it cannot be easily returned to Mullingar. The characters will have to locate the team, salvage their notes and data, repair the starship and prevent the rival from delaying them further in order to meet their deadline. 6. The expedition was a ruse. One of the terrorist factions in Liberation Coalition sent their agents to MIHR to solicit funds for the expedition from the Professor and intends to purchase arms and explosives from their sources in the black market. The characters can work with the local authorities to recover most of the money, or thwart the terrorists’ actions personally. A quick competition. 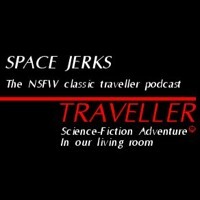 A $10 prize at DriveThruRPG for the winner. Design something (e.g. a character, a ship, a patron, a system) for the St. Patrick’s Map. The most interesting entry will win. The competition starts now and ends 16 March 2013. Last years winner was Randy with this write-up of Derry. Image from wikimedia. Creative Commons Attribution-Share Alike 2.0 Generic license.